Click ##http://www.sf-planning.org/ftp/files/Citywide/green_connections/GC_Wkshp2-3_Network_1.pdf##here for full PDF##. City planners continue developing a vision for a network of lush, pleasant streets prioritized for walking and biking between the city’s parks and waterfronts. 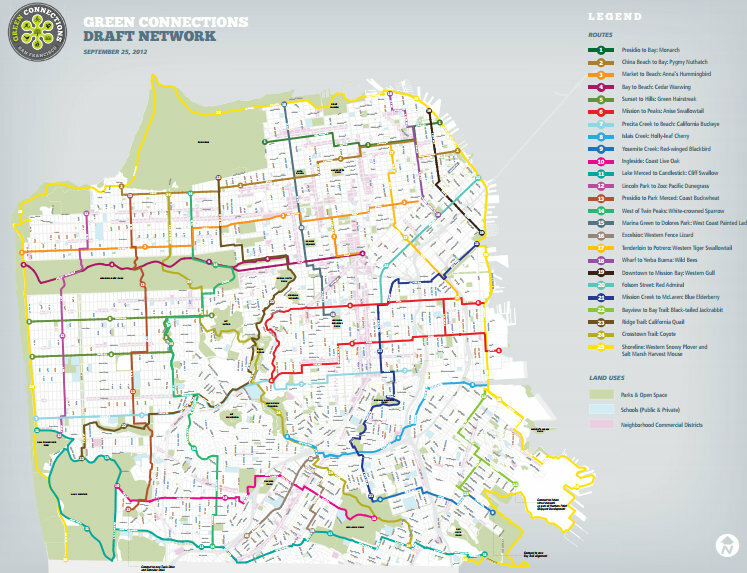 Staff from the SF Planning Department plans to present its draft network [PDF] for the “Green Connections” project at an open house next Wednesday, October 3, and the public is invited to weigh in on the selected routes. 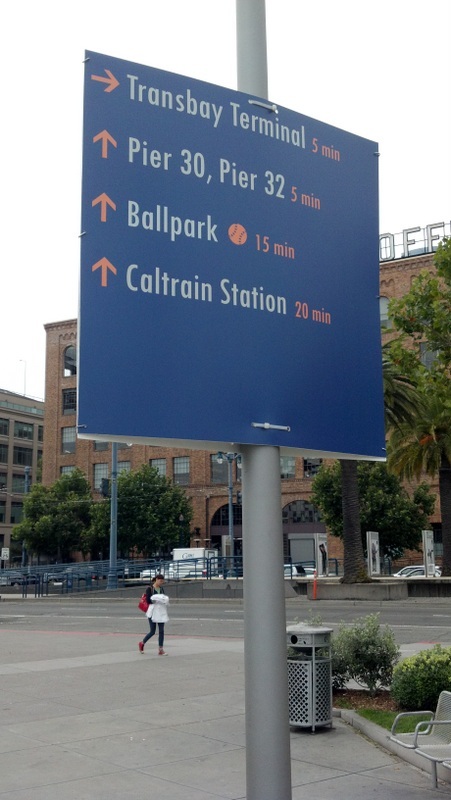 Coincidentally, one tool that could be used in Green Connections was recently implemented, at least temporarily, downtown and along the Embarcadero: Wayfinding signs listing estimated walking times to major destinations. Walk SF Executive Director Elizabeth Stampe said they’re an important way to help encourage walking, since many visitors (and residents) may be surprised to learn how quickly they can hoof it from one neighborhood to another. The idea of Green Connections is to lay out a plan of street routes connecting parks and waterfront destinations to prioritize for greenery, pedestrian and bicycle improvements over the next 20 years. In addition to the Planning Department’s community meetings, Walk SF has been leading park-to-park walks along with Nature in the City, and the SF Parks Alliance over the year to field residents’ thoughts on how the corridors can be improved. The signs at the Embarcadero were put in by the SF Municipal Transportation Agency to help point visitors to, from, and along the waterfront during the America’s Cup yacht races this year and next summer. They were recommended in the People Plan, which is aimed at making it easier for visitors to walk, bike and take transit to the crowded events. Not only would the signs be useful along Green Connections routes in other parts of the city, said Stampe, but they could also be complemented with informational signs about the local vegetation and wildlife on streets near parks to add an educational touch to the stroll. After Wednesday’s open house meeting, planners will refine the map and choose six priority neighborhood corridors for which to create conceptual street designs. Planning staffers say the plan, which is scheduled to be finished in about a year, would be used to help inform future street improvement projects, with the goal of revamping all 25 proposed routes, totaling over 140 miles, within two decades. The Green Connections Open House will be held on Wednesday, October 3, from 5:30 p.m. to 7:30 p.m. in the Rainbow Room of the LGBT Community Center at 1800 Market Street. Good idea. I’ve also seen them on bike routes (I believe Oakland has them). That seems much more useful to me than the obscure route numbers. Key destinations and directions, with distances and average time-to-bike (or walk) — that’s all you need, no clutter or ornament required. Complement signs like these with pavement stencil versions for foot-printing the details (as through the Wiggle, before we got the jumbo greenbacked sharrows) and we’ve got ourselves a legible route for humans to enjoy and traverse . . .
Do any of these people come to North Beach??? Grant as the north/south route from Yerba Buena to Fisherman’s Wharf? Um, it’s one-way. Vallejo???!!! Whatever. That map is junk. Who is paying these people? EDIT: ok this is a “green” network. Partially forgiven. But still. Coit Tower to Pier 39 is only 14 minutes, but there are some places I refuse to go. The only kind of signs which are helpful are those with destinations, directions, distances and time like the ones developed by the SFBC that Andy mentioned. This type of signs have allowed me to navigate places such as Lafayette and Palo Alto on my bike without being thrown into fast and heavy traffic and freaking out. As a result, that’s where I go on the weekends when I’m in need of sunshine. And guess what? That’s where I spend (a little bit!) of money too. I agree with baklazhan that numbers are pretty worthless, especially if you don’t have the corresponding map to use as a reference. And what about these cute but completely useless butterfly, bird and plant names? Sounds a bit like the interpretive displays gang was in charge of naming…. such a great opportunity tho, just hope it comes back down to Earth before it’s implemented! Please post your source for the wayfinding sign locations. #3 and #11 don’t make a lot of sense. #3 might be “25th and Third” (near Muni’s East Yard) while #11 might be “Ferry Plaza, near Market and Steuart”. Also, #9 would easier to find if it read “Fort Mason, near Van Ness and North Point”. Fort Mason is a place while the other two are streets. As stated, it’s directly from the SFMTA. Okay, was this a hardcopy press release, an e-mail, or a document on their website (sfmta.com) ? It was an email through their spokesperson, Paul Rose. Thanks for your replies. Please let Mr. Rose know that the list could do with some polishing before posting on their website. Looks like they’re planning on making 22nd street go through from Texas to Missouri (or open up some currently private stairs: http://goo.gl/maps/kVQkr ). I’m pretty sure the rest of the paths/stairs through there connect. What is the walking speed used to arrive at the times? 2 MPH? There is a big difference between a slow amble and a brisk walk. 2) The slope between the Texas / 22nd elbow and Missouri is very steep and is waste ground – a fenced off alley / driveway and a barren area to the west. There’s a housing project to the southwest perched on high benches above a mixture of businesses (e.g. the S.F.Food Bank on Penn. and 23rd). I think that the existing around-the-block (Texas / Sierra / Missouri) route is going to be the shortest route for the time being. Source: the map provided in this story. That’s why it’s ‘looks like’. The red line runs from 3rd to Potrero straight through on 22nd. Maybe they intended that straight line to mean popping north up to Sierra?